Hired a caregiver to help with shopping and errands? With the True Link Prepaid Visa® Card, you have visibility into a caregiver’s purchases for your loved one, so you know how money is being spent. Make sure you have visibility into a caregiver’s purchases for your loved one. Feel confident your loved one is not getting swindled and keep an eye on finances. Financial well-being and safety is something the whole family can agree on. With the True Link Prepaid Visa Card, you can monitor, manage, and limit a caregiver’s spending so that your loved one gets the groceries, medications, and household items that they need, while preventing unnecessary or unauthorized purchases. It’s simple to customize the card to meet your family’s unique needs. If a caregiver attempts to make an unapproved purchase or withdrawal, the card will automatically block the transaction and alert* you in real time. It’s easy to use and simple to manage. *Standard text messaging rates apply. The True Link Card's controls enable you to decide where and when the card works. 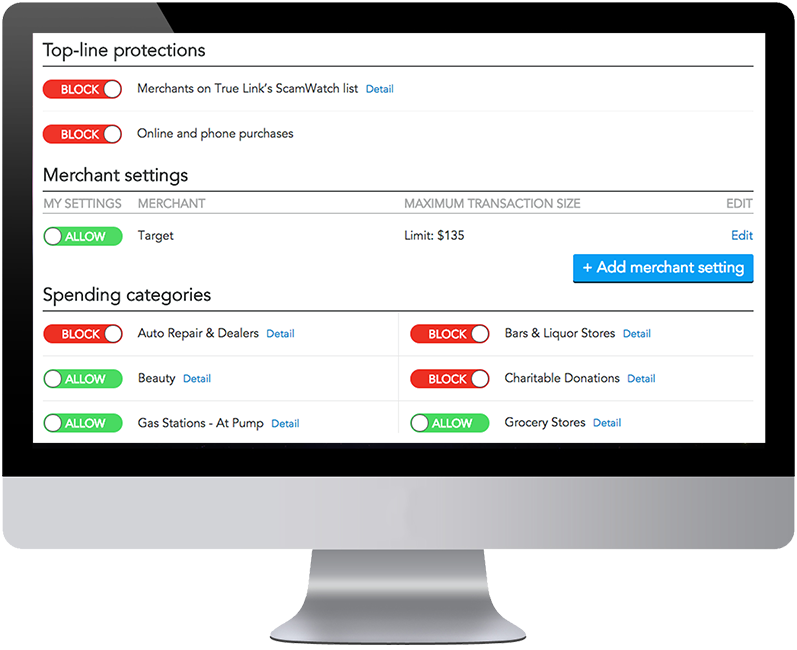 You can block unwanted transactions like online purchases, liquor stores, or international purchases. If you want to block a specific store or merchant, no problem. The True Link Card can do that. You can also set up the card so it only works at places where you want the caregiver to shop. Does a loved one need help getting groceries and picking up prescriptions? You can set up the card so it only works at those stores. Limits on cash withdrawals ensure that your caregiver can only access funds that you approve. You can choose to allow purchases on the card but prevent cash withdrawals or only allow cash withdrawals up to a certain amount. The card will be denied for any withdrawal above the limit you set. Plus you’ll always have visibility into completed or attempted transactions via your online dashboard. When a charge or withdrawal is blocked or when a spending limit is hit, you can choose to be notified via text message* so you can stay informed. Want to provide a caregiver more flexibility but keep tabs on spending? Set up alerts* for any charges above $20, and you’ll be notified of these purchases in real time. 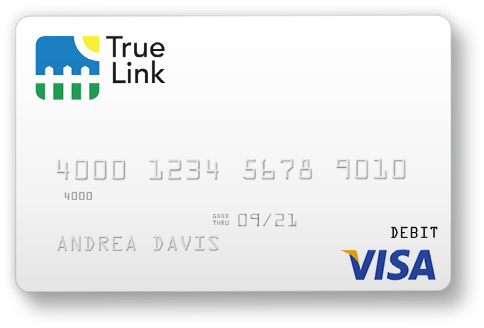 True Link Cards are reloadable prepaid cards that can be used for everyday purchases like buying medication at the pharmacy, grabbing lunch with friends and family, or getting cleaning supplies for the home – everywhere Visa debit cards are accepted. This all takes just a few minutes – you can do it all online. Have a question? We're here to help. Contact us at 1-866-984-8576. You get this peace of mind for a monthly fee of $10.00. Click here for a detailed description of all fees. Want to learn more about how to prepare for a caregiver coming into your family’s home? Head over to our blog for more information on how to keep your valuables and finances secure. This card is issued by Sunrise Banks N.A., St. Paul, MN 55103, Member FDIC, pursuant to a license from Visa U.S.A. Inc. This card may be used everywhere Visa debit cards are accepted. Use of this card constitutes acceptance of the terms and conditions stated in the Cardholder Agreement. We are required to periodically report certain Card information to the Visa Prepaid Clearinghouse Service (PCS) to assist in fraud prevention. Please contact PCS Customer Service for details regarding the information reported and on file with PCS. PCS Customer Service Department's business hours are Monday - Friday, 9:00 a.m. – 5:00 p.m. Eastern Time.